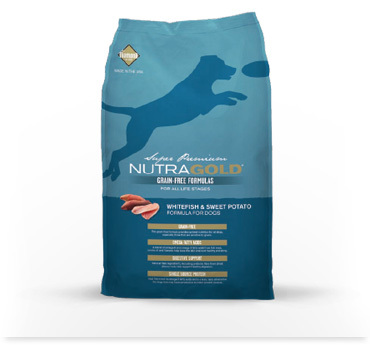 We believe every pet, from purebred show animal to shelter puppy or kitten, is worthy of the best nutrition. All NutraGold®Grain-Free formulas are made with the highest quality products and manufactured in the USA in state-of-the art facilities. 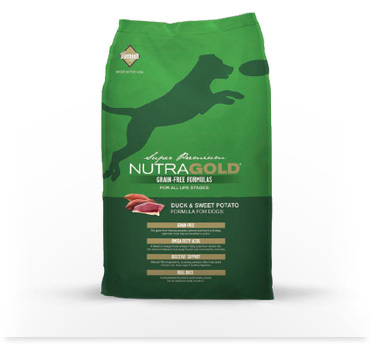 With carefully determined levels of protein, fat and nutrients, NutraGold pet foods are formulated to enhance the performance, appearance and overall health of your pet, day after day. NutraGold Grain-Free formulas contain the trusted ingredients you would expect from NutraGold, but without the grains. Grains, such as corn and wheat, have been implicated as causes of canine food allergies. Although dogs are able to digest and utilize the nutrition from carbohydrates, their bodies break down proteins and fats more efficiently. This is why NutraGold Grain-Free formulas are made to be rich in protein, particularly animal-sourced protein. A diet free of grains and rich in protein will eliminate the possibility of food reactions to grain and optimize digestion for your dog.